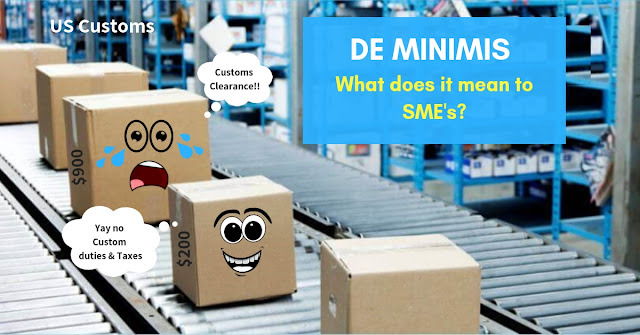 How De Minimis can benefit SMEs ? Internet revolution in India has upended many unexplored business domains and one such is the e-commerce industry; this in turn, has made way for many small businesses to go online. The mass migration towards e-commerce businesses has persuaded the domestic market to the edge of saturation. If this is the case, have you ever given a thought on what could be the plan B in order to survive in the competition? Unless you try out new innovations in business you cannot persist for a longer span of time. One of the most appropriate ways to broaden your e-commerce business is through penetrating into the International market. You might be an individual shipper or an ecommerce seller, knowing the definitions of the shipping terminologies is very essential in order to ship your goods without any obstacles. These terminologies will be of great use especially when you are new to shipping or when your shipment is stuck in transit. Below are few of the important shipping glossary which is commonly used while shipping. AWB: Airway bill It is a document used to identify the goods or parcel which is exported or transported through airway mode. It is used to easily track out and check the status of the goods shipped. AD CODE: Authorized Dealer Code It is 14 digit code given by the bank where the company possess the current account in order to act as their official banker for the payment purpose. Learn More.